The detail is both solace and surprise for those of us who had the good fortune to meet Katie Lee. A folk singer, an actress, an outspoken advocate against the construction of Glen Canyon Dam, the woman was a force. A fire. A hell-on-horseback beauty who, if ever she was afraid, never showed it. In January, I had the great privilege of visiting Katie in her turquoise home in Jerome. 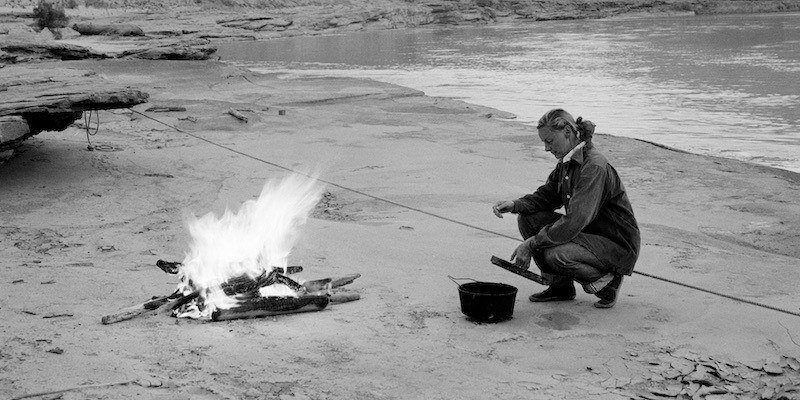 She plated cookies and brewed coffee and talked about her adventures in Glen Canyon with Tad Nichols and Frank Wright in the 1950s and early 1960s. Together, they documented the topography of the place, they named side canyons, and they found secret Edens that were — ultimately — flooded by Lake Powell. Sometimes, Nichols would photograph Katie there, her body tucked into creases in canyon walls or half-submerged in its precious water. She cried a little as she talked about the loss of her canyon. More than 50 years later, its death by drowning was raw and painful that cold Thursday morning at Katie’s house in Jerome. Writing about Katie in the past tense will be raw and painful for many of us for years to come. At 98, though, Katie lived. She inherited the mantle of conservation that activists like Edward Abbey and David Brower laid out for later generations. The author of five books, she was a beautiful poet, a lyricist, a diarist. Her folk-singing career took her around the world, and her beauty and talent won her a successful early career in Hollywood. What a wonderful thing to have known her. The love of my life has passed. I shall miss her, but her memory burns deep within me. Rest in peace dear friend. Beloved Katie, I don't know how it's possible to feel so sure that you are gone too soon when you stayed here for 98 years, except that you had more to do. We joked about you taking that dam with you when you go. Perhaps from another place you can have your greatest influence. My Mom, who surely welcomed you with a song, will be glad to give you a hand. I will hold that vision of you returning the beautiful Glen Canyon to us! I love you, sister. Thank you for everything. You have a permanent place over my mantle and in my heart.